The 2009 Lindsay Sanders Mann Reunion was held June 14, 2009 at Cokesbury United Methodist Church. The family of G. O. "Buck" Mann hosted this year's reunion and did an excellent job. It was noted by Kathy Bullard Haney that this day was Grandfather Buck's favorite day of the year. 77 people were in attendance including 12 from Buck's family, 12 from Maude Mann Dewar's family and 4 descendants of Lindsay Mann's Great-Uncle Daniel Mann. The traditional penny pitching for the kids took place out in front of the church and group photos were taken of any of Lindsay's grandchildren in attendance. It was decided that Maude Dewar's family would host the 2010 reunion. The 2008 Mann Family Reunion was held June 8th at Cokesbury Methodist Church. A very hot day (102°) did not prove to be a deterrent to attendance: a turnout of 137, perhaps the most ever. Great food (as always) and excellent efforts by the three host families led to a very good time being had by all. The families of Roberta, Raymond and Sallie shared very interesting information about their parents and other family members. In addition, Clayton Mann provided some detailed information on the O'Connell family and Anderson A. Holt. It was decided that the reunion on 14-JUN-2009 will be hosted by the family of Benona Sanders Mann. 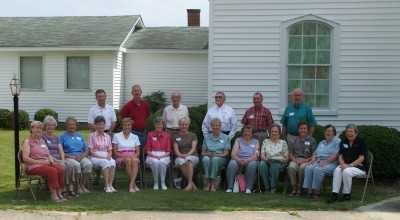 The 2007 Mann Family Reunion was held June 10th at Cokesbury Methodist Church. Good weather, good food (as usual) and laudable efforts by the three host families led to a big time being had by all. The attendance was excellent—the turnout of 109 was the most since 1990. Twenty of Lindsay Mann's grandchildren attended and many great-grandchildren. Several states were represented and we were even joined by two cousins from New Jersey who came to the reunion for the first time. It was decided that the reunion on 8-JUN-2008 will be hosted by the families of Roberta Mann Senter, Raymond H. Mann, and Sallie Mann Abernathy.